I didn’t know how long I would stay in Cairo but was certain that I had to be with my family and people at this critical moment. As a university student and young leftist, I took part in many protests and heated meetings by opposition groups. But we were always the same 300 to 500 faces. We used to joke that the thousands of Central Security Police the Interior Ministry sent to our protests made us each feel like we were worth 100 people. The regime corrupted even the opposition and used all the dirty tricks to co-opt it under the claim of being a “nationalist” government. The result was that those traditional opposition parties lost all credibility. This is why many never expected the massive revolt that was now sweeping the country. I arrived at my family’s home in Mohandseen after a three-hour drive from the airport. Every 10 meters, there were the so-called “popular committees” made up of ordinary citizens to protect their neighborhoods, replacing the massive police force that had dissolved itself in the most conspiratorial manner. Despite the fatigue of a 10-hour flight, I was barely home for half an hour before heading straight to Tahrir Square. The scene of hundreds of thousands of Egyptians, from all walks of life, occupying Tahrir Square to demand their basic democratic rights was something I would not have ever imagined in my wildest dreams. I was overwhelmed and couldn’t hold back my tears of joy. I also felt more confident that I made the right decision to return home when I saw many old friends who had done the same: Noha came from California, Dalia came from Manchester, and Emad came from London. All of us agreed that we could not have missed being here at this historic moment. More reassuring than seeing old friends, however, was the presence of the youth, the real heroes of Egypt’s revolution. The moment I entered the Square, I saw the Egypt I had dreamt of - one free of corruption, rigged elections, a brutal police force, systematic torture, and a ruling elite that lied to us daily with no shame. President Mubarak made his now infamous speech in which he pronounced his desire to “die in Egypt.” I immediately felt the impact in the street on my way back home. The popular committees were more aggressive with their questions and one man said he would “break my head in” if I took the same route again. Suspicion and fatigue were setting in. When I headed to Tahrir, the atmosphere was tense, as if the thousands who gathered there sensed something bad was going to happen. But what really happened was beyond what any of us imagined. None of us could believe our eyes when we saw camels and horses charging towards the Square with men on them carrying swords, knives, whips and wooden sticks (known as shouma). The slogan that the young Egyptians raised since they started their revolt “selmeya selmeya” (“peaceful, peaceful”) obviously made no difference to these thugs. They led a sudden attack into the square, tearing down the banners and beating up the protesters—men, women and even mothers carrying children. Yet, it took only minutes for the protesters to launch their counterattack. Our main weapon was our resolve and determination. Rocks were flying like rain from the sky. The result was that for the hours to come, protesters carried their colleagues to nearby field hospitals. Some looked dead, or nearly dead. I stood helpless for minutes unable to do anything but cry. Then a protester, blood coming out of his head, faced me, asking where the doctors were. I led him to the nearest field hospital. For the next few hours that became one of my roles: carrying the wounded to the hospital. When the thugs began throwing molotov cocktails at the Egyptian Museum the protesters rushed to put out the fire, reflecting the love they had for our country’s history. Live ammunition shots were also being fired. I later found out at least 10 protesters were shot dead. It was well after night fall that the army finally intervened and started shooting in the air, clearing the area. I left the Square that bloody night only after I was certain that the thugs were defeated and forced to retreat. After a sleepless night of following the news to make sure Tahrir was not under another attack, I headed to the Square again. It was immediately clear that the former regime’s plan was to launch a civil war between Egyptians. When I reached Qasr El-Nil Street of Talaat Harb Square, I saw groups of thugs chanting pro-Mubarak slogans blocking every single street leading to the Square. They were accompanied by secret police in civilian clothes. I thought my press pass indicating I worked for Al-Ahram would make it easier for me to get through. I lied and told the police and their accomplices I was heading to the government-owned TV station to take part in a program calling for an end to the protests. It didn’t work. The thugs, with their knives, swords and sticks, were adamant about not letting anyone into the square. Nearby, I saw some of them surrounding a young woman with red hair and piercings in her eyebrows. They were pulling her hair, beating her and yelling “American, American.” She was crying nonstop and saying, “shame on you. I’m Egyptian, I'm Egyptian.” I tried to intervene, but they started attacking me too. A minute later, they pushed both of us in a taxi, together with five other men. We were taken to a building controlled by the Army’s Military Police. The seconds between leaving the taxi and reaching the gate of that building were the worst. A group of people who stood in front of that gate greeted us with more beatings and insults. Inside there were perhaps as many as 200 people being held. They were mostly bearded young men, as the thugs in the streets were told that the revolution was led by the Muslim Brotherhood. There were also 15 foreign journalists with their cameras and equipment. I had to wait for nearly three hours until the commander, when he saw my press ID, let me go, together with Yomna, the young woman who had been attacked. I felt so exhausted and scared at this point that I did not go back to Tahrir. By preventing food and medicine from reaching the protesters on top of the use of vicious violent attacks over the previous two days, the Mubarak regime had shot itself in the foot. These tactics only made ordinary Egyptians more sympathetic and led to more than a million people coming to Tahrir Square today. The numbers of protesters filling the square had increased every day. Our slogan: “the people want to overthrow the regime, the entire regime,” became more widespread. Today my 74-year-old father joined me in Tahrir for the first time. Tears came to his eyes at the sight of the throngs of jubilant youth chanting, “Welcome, welcome our heroes, come join the freedom fighters.” This was another creative method by the organizers to attract ordinary citizens. Ten hours later, my father didn’t want to leave Tahrir. Hours before Mubarak was slated to give another speech, there was a near certain expectation among everyone in the square that he was going to announce his resignation. We were singing, dancing and celebrating a victory that we were certain would come. Yet, Mubarak didn’t resign. Shock spread through the crowd. I was sitting on the ground listening to it on my mobile phone. Hardly half way through the speech, I heard protesters chanting, “erhal! erhal!” (“Go! Go!”). Many people insisted they would return the next day, not only to Tahrir, but to the presidential palaces in Heliopolis, Abdin, and Ras el Teen in Alexandria. I headed towards Tahrir expecting a clash with the Army, recognizing that this was now Mubarak’s last hope. Rumors spread that the Presidential Guard would shoot to kill if protesters stormed the palaces. This did not scare the thousands who were heading to Orouba Palace in Heliopolis. The Egyptian army commanders obviously recognized that Mubarak’s refusal to relinquish power had become the main problem, and did not impede the gathering protesters. 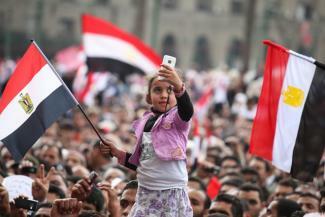 All of those in Tahrir were proud to be Egyptians that day. For the first time in our history, Egyptians managed to overthrow an unjust ruler in a popular revolt. The love that Egyptians showed for their country over these past 18 days will certainly be the main pillar to protecting our revolution. Khaled Dawoud is UN Correspondent for Lebanon's pan-Arab daily, As-Safir. Before that, he worked for four years as Al-Jazeera Arabic Correspondent in New York. From 2002-2006, he was bureau chief of Egypt's daily Arabic newspaper Al-Ahram in Washington, DC.